Jessa Diva, under jockey Porfirio Cano, easily posted the fastest qualifying time for the New Mexico State Fair Derby Sunday afternoon at The Downs in Albuquerque. ALBUQUERQUE, NM—SEPTEMBER 9, 2018—Longtime trainer Fred Danley saddled the top two qualifiers for the New Mexico State Fair Derby Sunday afternoon at Albuquerque. He is also the owner of both and the breeder of one. The 10 fastest qualifiers from today's three trial races over 400 yards for New Mexico state-breds will return to The Downs in Albuquerque on Sunday, September 23 to vie for the winner's share of the $150,000-est. purse. Ridden by jockey Porfirio Cano, Jessa Diva rolled to a 1-¼ length win in the last trial to post the fastest time of :19.544 seconds, a 91 speed index with an 8 mph tailwind. It was the first win six starts this season for the daughter of leading New Mexico sire Jesse James Jr.
A multiple stakes qualifier, the MJ Farms bred filly from the Special Leader mare Leading Diva, was a finalist in the Zia Futurity(RG1), Mountain Top Futurity(RG3), and New Mexico State Fair Breeders' Derby at 2. 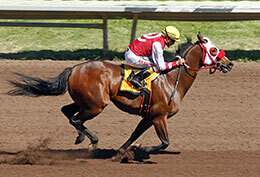 She finished third in the restricted Grade 3 New Mexico Breeders' Stakes in May and has earned $62,505. Danley's second qualifier Hollywoodcrown, came in the second trial when the Heza Motor Scooter filly defeated Jenna Cartel by three-quarters to get the second fastest clocking of :19.602 seconds. The Danley homebred also had the riding services of jockey Porfirio Cano. Third in the New Mexico State Fair Breeders' Futurity and the New Mexico Classic Cup Futurity(RG2) last season, Hollywoodcrown has banked $96,848. She is out of the Thoroughbred daughter of Gone Hollywood, Hollywood Gone. Mason King's stakes winning filly Regard he Rose was a neck winner over Flash Moonfire in the opening trial to get the fourth fastest time of :19.719 seconds. Alfredo Triana saddled the Chicks Regard filly from the Coronas Blackdiamond mare Not Sable Shes Rose. Alfredo Triana, Jr. was aboard last year's Arapahoe Park Futurity winner who has earned $68,267. Coronas Black Diamond Partnership is the breeder. For the complete list of New Mexico State Fair Derby(R) qualifiers with their times, sires, dams, owners, breeders, trainers and jockeys CLICK HERE. The Downs at Albuquerque Racetrack and Casino is located in the heart of Albuquerque at Expo New Mexico, the home of the New Mexico State Fair, and general admission and parking are always free (via the casino entrance at Louisiana and Central) . For more information, visit abqdowns.com and click on the "Racing" link at the top of the homepage.